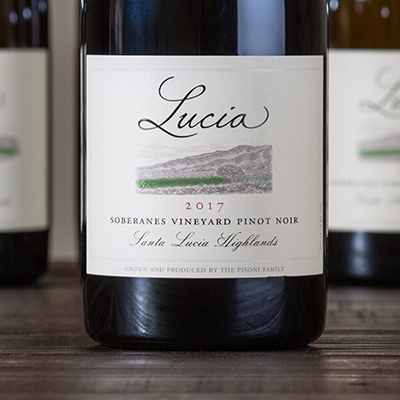 Deep ruby as it fills the glass, the 2017 Lucia Soberanes Pinot Noir offers a stunning bouquet of fruit, spice and floral notes. Black cherry, currant, Santa Rosa plum, and rose petal interweave with delicate savory notes of sage, wet earth, and baking spice. Partial whole cluster fermentation and meticulous cap management have yielded soft, elegant tannin together with a persistent finish. Perpetual afternoon winds sweep away any lingering morning fog during the growing season, preserving the acidity that becomes the backbone upon which this wine is built. Long-term cellaring will satisfy any palate, but for those who simply cannot wait, early drinking will also prove rewarding.